Everybody who has been playing guitars or knows anything about it will tell you that there is so much more to a guitar than just a guitar. And I am not talking about talent and will to succeed and all those feel-good stuff. I mean literal things you need. And YES, this might not be as inspiring of a post as “All you need to become the next Jimi Hendrix is sheer will power”, I think this one is more practical and will get you closer to your goal than that BS (excuse my abbreviated French). So, let’s talk business. When you get your guitar you might feel like you have done the job, researched your stuff and now you can go on practicing. While is some cases that is true and you do not have to buy anything, there is definitely not the case will a lot of people. For instance, if you just bought your first guitar you probably have no idea how to tune it. That brings up the issue of a tuner. While a lot of old school people might say that you should learn how to tune with your ear, that is rarely practical. And also, if there is a way to ease your job why the hell would you not do that? You have feet to walk but that sure as hell does not mean you should walk 100 miles to another city. That is why we have freaking cars. The same goes for tuners and a lot of other guitar accessories and items that will come in handy. Although I am putting strings in the “accessories” section they are definitely not an optional accessory. I mean come on, the guitars ship with string sets. That has to say something about the importance of the strings. Every guitar type, be it acoustic, electric or bass has specific requirements for string sets. For instance, if you got yourself a nylon string guitar you better not get a steel string set. If you make that mistake you might end up with a damages guitar neck because the pressure that the steel strings put on the neck of a guitar is much higher than pressure from nylon strings. The other thing you need to consider if the gauge of the strings. The three basic ones are light, medium, and heavy. There are some in between measurements as well but these are the basic ones. Depending on what guitar you have or your experience level you will need to get strings with different gauges. For instance, if you are a beginner who just got their first acoustic guitar to play folk style you might think of getting a light to medium gauge nylon string. To learn more about strings follow the link. Thickness – The thickness of a pick can range from 0.45mm, which is extra thin, to 1.20mm – extra heavy. Which thickness you choose will definitely depend on your personal preference AND what guitar you are using. For instance, if you play an acoustic guitar or you are a beginner who is not that comfortable with the guitar you might go for thinner picks. If you play electric guitar you might prefer thicker picks. Material – There are so many varieties of materials used for picks it is almost impossible to go through all of them. The most popular ones are nylon and celluloid. Both produce different textures and comfort levels for players while also producing very different sounds. For me, nylon is the best one because it is durable and has a nice texture, making it easy to hold and play with. There are also more posh materials, like gold or tortoiseshell but they are, of course, a lot more expensive. Unless you are growing money on trees you probably do not need a gold pick that will basically do the same task as cheaper picks but for a much higher price. Texture – I will touch upon the texture very briefly. One thing a lot of people do not take into account is the texture of the pick. For me, the more textured the pick is the more comfortable I feel strumming it. If you have been practicing for a while or are gigging in a hot room you most probably get a bit sweaty and there is nothing worse than the pick slipping through your fingers while the audience stares at you and the only sound you hear is the noise of a fly. 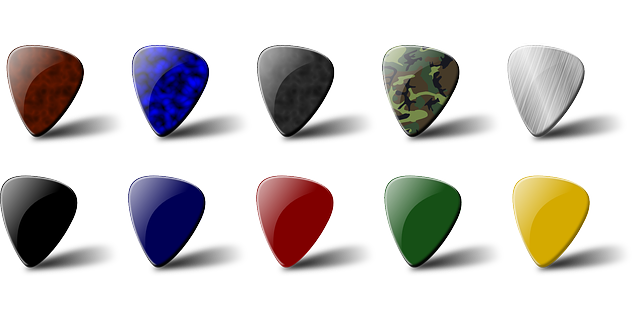 Shape – While most people usually use triangular shapes picks there is also variety in that factor as well. If you are a beginner, I would definitely recommend you to go for the simple, triangular shaped pick. It is versatile and comfortable. But if you are looking for something new or more “exciting”, you can try out sharp-edged or shark’s fin pick. With shark’s fin pick you can use two different sides for different purposes. If you want a messy, scratching noise you go for the scrapes side. That all will depend on what effect you want to produce. Let me tell you a very short story. Well, it is not really a story but just an anecdote of my irresponsibility and lack of thought. I would call it a tragedy. Once upon a time, when I used to work for a minimum wage job in the library (yeah, do not ask) I started saving up money I could. And by saving up I mean, I would just eat instant ramen and drink on weekends whatever my friends would bring to the campus. I was saving up for months to buy a guitar that I would just stare at in my local shop for months and months. I used to go to the store every week not buying anything. At some point, the manager probably thought I was some sort of a weirdo and he would not be wrong. I finally saved up enough to buy the guitar of my dreams (and by dreams I mean whatever my savings and budget could afford). So I buy the guitar, practice for a couple of weeks and then I leave it in my dorm room, just leaning against the wall of the extremely narrow hallway. I guess you put two and two together and know what tragedy took place. I damaged my guitar and although it was saved, it did take a couple of more weeks of only instant ramen to pay for my baby to be fixed. A lot of people would not consider gig bags as “NECESSARY” but trust me, there is no regret bigger than the one you feel when you damage your guitar. Even if you just get the most basic gig bag that is already a step in the right direction. Gig bags do not provide the same level of protection as cases but they are definitely more lightweight and easy to carry around. Also, when you do not need it you can just pack it up and put it in the storage. There are also different quality gig bags, some of them, like hybrid gig bags, do provide quite a decent level of protection. Guitar cases do a lot better job of protecting your guitars than gig bags. That being said, they are also ridiculously heavy and hard to carry around. Two thing to consider when choosing between a case or a gig bag is the price and also the fact that cases protect your guitar not only from actual accidents but also from humidity change. Humidity change is a big deal that I will be discussing later on in this article. If you are an avid guitar player and practice a lot, especially standing up, your hands will get tired. No matter how lightweight is your guitar you will feel its weight after several hours of holding it up. That is why you might need straps and strap locks. Yes, there are varieties of straps ranging from nylon to leather and from very short to more lengthy ones but for a starter, I think a regular nylon strap will do the job. 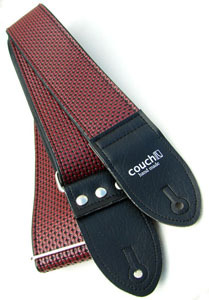 Make sure that the width of your strap is big enough so that it does not irritate your shoulder. As for the strap locks, some guitars come with inbuilt locks. In any case, the price of the strap lock is low enough for you to not worry about going bankrupt. These two accessories are the 101 of guitar safety and should never be overlooked. Clamping devices that regulate the pitch of your guitar and help you play in different keys, capos are not a necessity but once you start practicing a bit more and experiment you might consider getting a capo. If at one point you get interested in slide guitar technique, be it to play blues or genre that incorporates sliding, you will have to get guitar slides. 101 of Slide: it is basically a tune that you put on your finger and use to put on strings to create more vibration. When buying slides always keep in mind the thickness of the material. Thickness will affect how comfortable you are using it and also how durable they are. If you mostly practice at home and do not take your guitar outside your room, maybe a guitar case or a gig bag is not your number one priority. But in that case, a guitar stand should definitely be one of the number one things to buy. You do not want to just lean your guitar against a wall and pray to Jesus that it does not get knocked over and damaged. That is why stands are a great option. They come in varieties. There are A-Frame, racks, and wall hanging “stands”. If you do not have a lot of money to spare on accessories consider A-Frame if you do not have a lot of space in your room then go for a wall hanger. For me, tuners and metronomes are a necessity. At least in the beginning when your ear is still adjusting and learning how a guitar should sound. So when I got my first guitar I bought tuner/metronome the same say. What a tuner does is basically pick up the pitch of your guitar and helps you tune. There are varieties of tuners, some are just basic needle dial, some are LCD. I do not think you need to spend too much money on tuners that have some extra features because most times you will probably forget about extra features or the cool look of the tuner within a week. 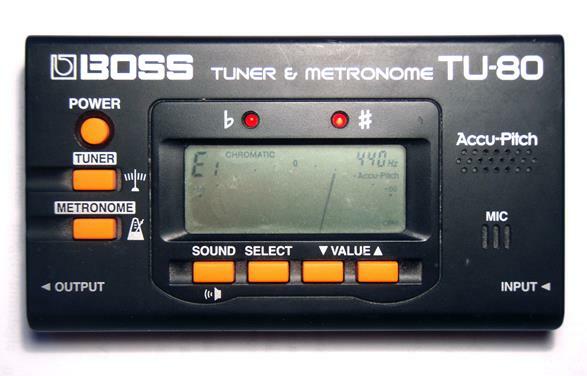 As for a metronome, it is basically a device that measures your tempo in BPM (Beats per minute). One great thing that manufacturers have come up with are tuner/metronomes. They are a device that incorporates both tuners and metronomes and save you up a lot of money and space. Basic Cleaning – Whether you are using your guitar once a month or every day you have to clean your guitar. You just got to. Dirt from air and oils from your hand are a straight and easy way to dull your guitar and make it useless. That is why you should be using cleaning products specifically made for guitars. Please, for the love of God do not use a dishwashing soap or something along those lines. If you have no idea where to start, one thing you can look into is cleaning kits that will have all the materials to keep your baby fresh. One of the most popular ones on the market is Music Nomad MN108 Premium Guitar Care 5-Piece Kit. Humidity – It should not be a big surprise for anyone, even beginners, that your guitar changes with time. Guitars are made from tonewood, actual wood that will change no matter what. The key is to make the tonewood change for the better. The first step is, of course, to just get a guitar with the type of tonewood that will get better. The second step is cleaning the wood. And the final step is maintaining humidity levels of the room that your guitar is in. you need to avoid too much moisture or too little moisture. The easiest way to do that is humidity control products like Boveda 2-Way Humidity Control for Guitars or Acoustic Moiss Humidity Controller. And finally restringing. While you might be satisfied with your strings, for now, you should restring your guitars once in a while. Sometimes if you have been playing for on a daily basis you might not notice how the strings get duller. Dull strings create dull sound and you definitely do not need that. The other reason why you should restring more regularly is that they get worn out and you do not want one of the strings to break and take your eye in the process. Restringing for a lot of people is not the most exciting process but you should learn how to do it at one point or another. This is just one small thing you do not even have to do too often and it does not even cost that much. Most string sets go for around $5-10. Getting a guitar is only the first step to achieving your goal. Whether you want this to be your hobby or you are planning on becoming the next big thing you will need some accessories and maintenance items. While some things like strings, picks, and gig bags/cases are unavoidable and necessary, other accessories like straps or capos are not a requirement per se (I mean for a basic requirement, you will definitely need capos for certain things).